Aboard the spaceship “The Huckleberry” a trio of space pirates – Uncle Yellow Shoulder, kid niece Sardine, and kid cousin Little Louie – race across the reaches of space to foil the plots of the evil chief executive dictator of the universe, Supermuscleman and his side kick, Doc Krok. SARDINE IN OUTER SPACE is a funny, mildly irreverent, “Captain Underpants” meets “The Rocky and Bullwinkle Show” for all ages. I thought that was a rather clever thing of me to say until I realized that my friends over at All Ages Reads said the same thing first. That just tells me that it is right on. I enjoyed reading through this book, but the whole time I felt guilty that I was somehow breaking the rules and reading a book that I am not welcome to read. As the inside cover says: “No grown-ups allowed unless they’re pirates or space adventurers”. This book is for kids – written for them, illustrated for them, and all about them. The kids act like kids, feel like kids and do kid-like things. All of which gets them into all kinds of trouble, but that is just how it is when you are a space pirate. The characters will appeal to kids because they are just a bit naughty. They wear skulls on their shirts, have scars, and their clothes are tattered and worn. Emmanuel Guibert’s writing is tight and concise; the stories are short and to the point. A kid can pop through one between finishing one assignment and beginning another. It’s almost like experiencing a toned down Monty Python or Mel Brooks movie. This is great children’s humorous literature. It is clever and full of all kinds of references. Be warned. With irreverence comes some things that could raise the ire of parents. On page 40, Sardine cuts a honkfish in half. It doesn’t kill him; why I don’t know. That’s how it works in the Sardine universe. Also, as a space pirate, Captain Yellow Shoulders drinks space rum. They are pirates after all. You have to expect some things. Other than that, it’s fine, but you should consider your community. Joann Sfar has done a brilliant job illustrating this book. Her style fits the writing and theme of the story and gives it a child-friendly appeal. Honestly, when I first saw the art, I was not impressed, but after the first chapter, I knew that this art was perfect for this comic. The more I read it, the more I love the art. I think kids will too. Check out the this page. Galactic Booger! Kids will dig that. From cover to cover this is a book that is meant for kids. It may be too irreverent, silly, or too filled with bathroom humor for many grown-ups. 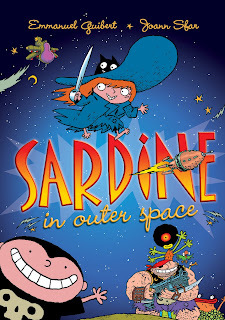 SARDINE IN OUTER SPACE is a good book to help that inattentive, uninterested, unmotivated, frustrated student. Some kids do not care about reading, even good works like Harry Potter. Books can seem overwhelming. This comic holds some things that those books do not. It is irreverent. Because of the bathroom humor and focus of the book, a teacher might be inclined to pass on this comic as having little literary value. That would be wrong. This book, unlike other works, has a special draw for certain kids. It may just be the book to spark an interest in reading. Besids, our culture’s best comedians have started out reading comics, MAD magazine and other things deemed trash. They spent time in class getting in trouble for joking around. A sense of humor is the best way to help students cope with life and deal with anger issues. If properly channeled and coddled, that annoying jester may be able to turn his kidding into a profession someday. For the kid who likes this book, encourage him or her to write funny stories and use comedy in his or her journals. The chapters are very short and are stand-alone stories. This allows that reader with a very short attention span to read without feeling overwhelmed by the number of pages. 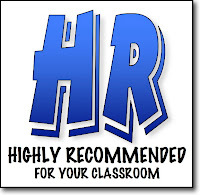 It also lets students read a little bit between assignments. This is a French book that has been translated into English. At the time of publication, there were two more volumes in the series. A creative work of children’s humor, this book has a special place in your library. "Sardine in Outer Space" series.